There were noticeably fewer participating restaurants in Singapore Restaurant Week from 24 to 31 Mar. Decided on Coriander Leaf, a Pan-Asian restaurant on the 2nd floor of Chijmes. 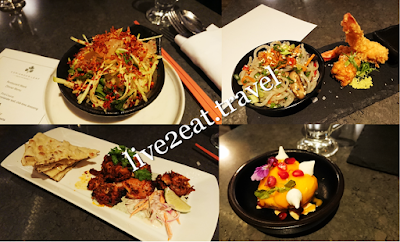 Could neither rave about its first course of pomelo and green mango in chilli-lime dressing topped with coriander leaf, nor fault the dessert of Alphonso mango sorbet with fresh fruit salsa and meringue. Thai mango salad was followed by second course of tiger prawn tempura, and sweet potato noodles with honsimeji mushrooms and edamame. Do not expect the tempura to be thin and crispy like how it was done in a good Japanese restaurant, or the sweet potato noodles to be springy and chewy like how the Koreans do it. But the sweet prawn and flavourful japchae made up for what this dish lacked, and I liked both the mushroom and edamame. Main course of tender Tandoori chicken, served with cucumber relish and mint chutney, was well-marinated and went well with the butter naan.